If you’re into indie games and have a Switch, you’re drowning in options right now. Even though Stardew Valley and Golf Story are begging to eat up all your free time, don’t forget Oxenfree, a charming adventure game about being a teen, and also ghosts. Oxenfree is billed as a horror game, but it’s mostly about navigating relationships. You play as Alex, who’s going to an overnight party on an Island just outside of town, and she’s greeted by some unresolved tension with her dead brother’s ex-girlfriend, her friend Ren’s crush on new girl Nona, and has to introduce her new step-brother Jonas to all her buds and all their issues. That would be a handful even without the ghosts that show up. 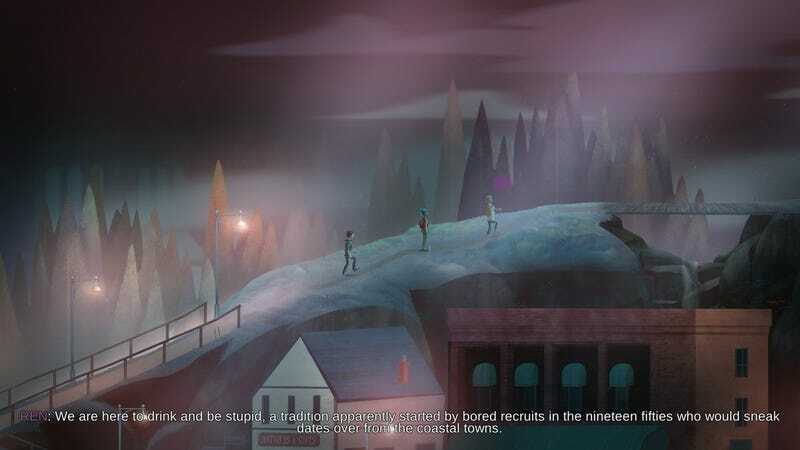 When deputy editor Patricia Hernandez reviewed Oxenfree when it was released in 2016, she called it a “sharp and spooky” adventure game, and complimented its well drawn characters. All this holds true for the Switch version, which will allow you to take your angsty teens on the go. Revisiting the game today, I found the teens just as well written and well acted, and the tension and character relationships just as real. It was also great fun to dip back into the game’s dialogue system, which is one of its best features. Lines of dialogue will overlap with each other naturalistically, and Alex often has a chance to interrupt ongoing conversations. Unlike a lot of media about teenagers, Oxenfree hasn’t immediately become dated. These kids may have a few Diablo Cody-isms, but this game feels more Breakfast Club than Juno. People have already been asking me if they should try Stardew Valley or Golf Story first on the Switch, but if you’re at all into adventure games, Oxenfree might be worth your while first. If you’ve already played Oxenfree, you may also be happy to know that there’s a new game plus with a secret ending, along with an alternate reality game expanding the universe. It’s shorter than those other two games, sure, but its branching paths make it enticing to play over again. LIke Stardew Valley and Golf Story, Oxenfree also ultimately has a kind heart. When I first played this game, I desperately wanted Alex and her brother’s ex, Clarissa, to get along. By the time I finished the game, Clarissa had felt alienated by my actions. As I started it up again today, all this came rushing back, and I was glad to get a second chance at patching things up between them. I hope you’ll let these sad teenagers into your life.